To be honest, most of the trip had been tougher than usual, the unpleasant conditions limiting our options and success. Consequently, we’d only taken kingfish to around 22kg (along with a 50kg bass while fishing for them), hapuku to 35 kilos, some truly monstrous trevally in excess of 6 kilos, a bunch of reasonable snapper to four kilos, and squid that were so hefty they pulled line off our soft-bait outfits. This might sound like fantastic fishing to most people, and yes, it is, but when you’re at the Three Kings it’s the sort of fishing one expects – and usually more. Despite the thoroughly ‘average’ fishing though, and a knee injury suffered earlier that saw me wearing a bulky leg brace, the trip was one of the most enjoyable experiences I’ve had for some time. Indeed, it was a prime example of ‘people making the trip’, in this instance consisting of Charter Master Terry Williams King, and his friends Jon Terrell, Matthew ‘Big Dog’ Sheehan, Lee Snell and Simon Browne. As is generally the case, these guys came from a wide range of backgrounds, with the common passion for fishing and the outdoors uniting us. Even more critically though, they were happy to make the most of whatever happened, the good and the not so good, accompanied by plenty of good humour. 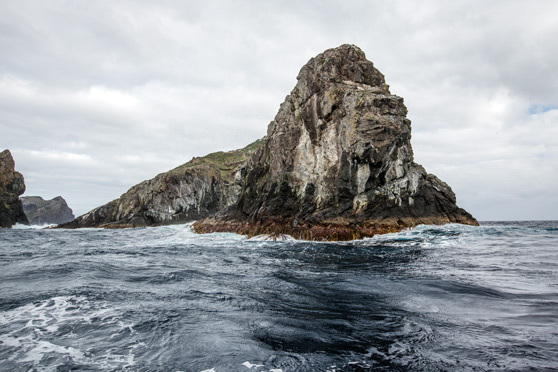 A month later, there we were, up at the towering, jagged, barrenlooking islands and rocks that are the Three Kings Islands, situated around 55km off Cape Reinga. And we were getting into our doctors outfits. I couldn’t help being a little impressed. Five burly blokes all dressed in various doctors’ attire – except for Simon Browne, who isn’t burly and “only had one day to get ready” so wasn’t dressed as required (there would be consequences!). Then the boat’s skipper and crew emerged from their sleeping quarters. Rick Pollock had a white doctor’s jacket with bloody hand prints on it, and a neoprene Shimano Tiagra 80 reel cover snugly fitted on his head (that’s the spirit, Rick!). As for the crew, they’d had their costumes ‘kindly and generously’ supplied by Terry. Yes, we had our nurses! I must say Terry had done a great job with the costume sizing: both young men fitted their very, very short, tight nurses outfits perfectly, despite dramatically contrasting physiques, with George being short and well built, while Kurt is tall and slim. Sure, their legs could have done with a shave, but those black fishnet stockings really accentuated Kurt’s long, pale legs and George’s sculpted calves. Their blonde, braided hair was nice, too… Hang on – what’s going on? We’re supposed to be red-blooded heterosexuals! And this was only day three of five! But worse was to follow, with George revealing a pair of bright red underwear while bent over pulling up the anchor. It looked so very wrong! Then we were fishing, kicking our day off with a mixture of slowtrolling live koheru and casting surface lures for kingfish around the nearby Princes group of rocks. I’ve had some mind-blowing action around these desolate, weather-sculpted rocks in the past - but not this time. 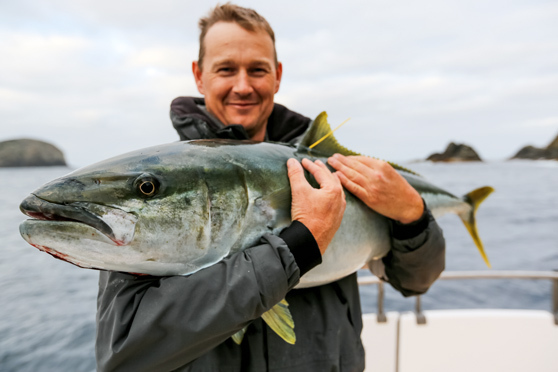 Sure, we still encountered several nice kingfish, with Doctors Williams-King and Terrell catching the two biggest around 20-22kg, but the fish were located in a very localised area and weren’t that keen on biting. The situation was even harder for those casting lures, with just one reasonable specimen chasing Terry’s stick-bait back to the boat. By midday we’d all caught a kingfish or two, seen some rather wonky sights in the process, and were starting to wonder if the deckies weren’t enjoying their new roles a little too much. 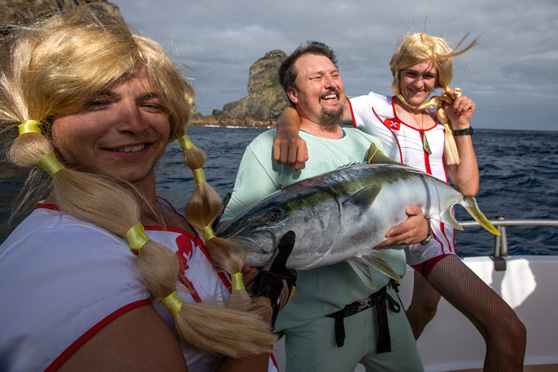 After all, they’d just treated the nearby crew and anglers of Gladiator to a bit of ‘flashing’, along with falsetto cries of, “Hi boys!” It was definitely time to get back to being anglers and crew members again! So we finished the craziness with a photoshoot to remember it by, before anchoring up near one of the Princes’ towering rocks. 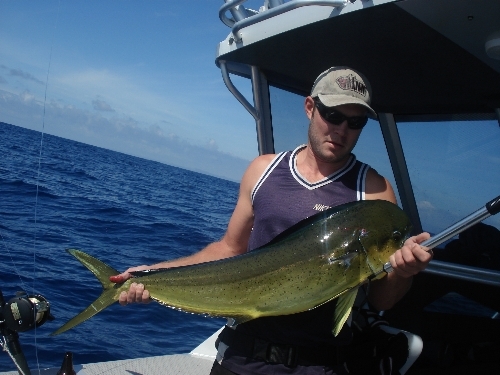 This spot often offers monster trevally – as well as assorted kingfish to almost uncatchable proportions. 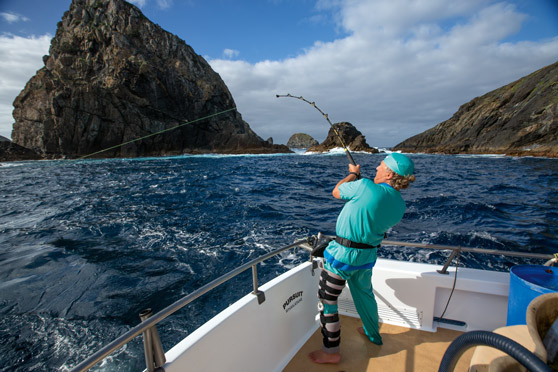 With my injured knee robbing me of some physical confidence, I decided to fish for trevally using my soft-plastic outfit – a very risky thing to do at a place like the Three Kings, where many of the locals are hard enough to subdue on heavy stand-up gear. 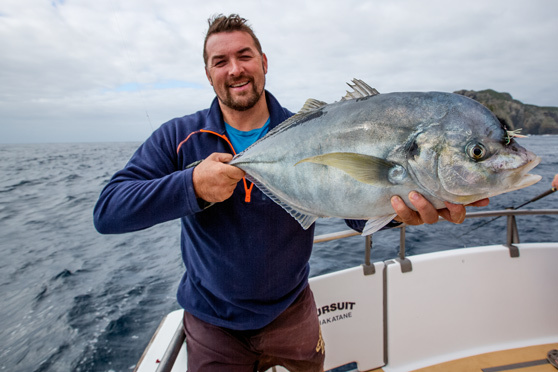 However, Terry’s next attempt was much more successful, resulting in a lovely trevally of 5.5kg being landed. My second hook-up was looking much more positive, too, somehow avoiding obliteration early on. Five minutes passed; I was still locked in battle – and at that point several slab-sided trevs emerged amongst the berley scraps, casually sucking them down and drawing gasps from onlookers at their size – particularly a couple of specimens, which appeared to be at least seven kilos! I was vaguely aware of Terry unhooking my salt-fly outfit and disappearing into the saloon, but was much too preoccupied to dwell on it. Next moment, there he was, christening my new outfit, while I could only keep pumping and winding my soft-bait set enviously – with a gleeful yahoo, followed by a long metallic shrill as line flew from the spool, signalling his success. A seesaw fight ensued, but to my faint chagrin – knowing what these fish are capable of and how hard earned they usually are on salt-fly tackle – this fish stayed high in the water column, well away from the tippet and fly-line shredding seafloor. Very unusual. But that wasn’t the end. In addition to the trevally, several reasonable kingfish were also landed, with the best specimen of 18-20kg caught by Simon. Then, to finish things off nicely, Jon and I enjoyed a double soft-plastic hook-up on kingfish. I can’t ever remember my little Daiwa Certate 2500 shrieking so hysterically before, and on two occasions wondered if I would be spooled. However, despite the gnarly territory and parked boat, both of us were ultimately successful, catching fish of 11 and 13kg. Later that evening saw a few of us sitting around the saloon, chatting and drinking and tending to the aches, bruises and cuts that typically accompany such days. However, although a couple of abrasions were getting infected, no one called for a nurse.